The Sinclair Method (TSM) | Accepting New Patients. The Sinclair Method (TSM) is a treatment protocol for alcoholism developed by Dr. John David Sinclair. He was inspired by the Russian physiologist Ivan Pavlov, who received a Nobel Prize for his research for Classical Conditioning in animal learning. Dogs in Pavlov’s studies would receive a food treat shortly after the ringing of a bell. Pavlov observed that eventually the dogs would associate the bell with food and begin salivating at the sound of the bell. However, the degree of salivation would become less and less has he gave them smaller and smaller treats. Pavlov referred to this process as “extinction,” which later laid the groundwork for Sinclair’s scientific approach to treating alcoholism. Sinclair concluded that alcoholism is a learned behavior, after conducting laboratory experiments on the factors driving alcohol addiction and the effects of alcohol deprivation. A key discovery Sinclair made was that detoxification and deprivation do not stop the craving for alcohol, but actually increase subsequent alcohol consumption. The Sinclair Method sought to challenge the idea that physiological dependence on alcohol led to alcoholism, and propounded the concepts of ‘learned behavior’ and ‘pharmacological extinction’. TSM involves the use of the prescription drug Naltrexone to reduce cravings for alcohol. It is somewhat controversial in that it calls for the use of naltrexone in combination with your normal drinking habits. You do not need to go through detox first or stop drinking. Unlike other treatments that require you to abstain from alcohol, naltrexone must be used in combination with drinking to be effective. For this reason, if you are actively drinking, you are a better candidate for naltrexone treatment than someone who has been abstinent for over a week. It does not matter if you sometimes take naltrexone without drinking, but you cannot drink without taking naltrexone. Some individuals get a lot of reinforcement every time they drink, and over the course of their lives they have many opportunities to drink and get additional reinforcement. This manifests into a behavior that becomes too strong to resist, and they have a very difficult time controlling their drinking. The reinforcement occurs a neurological level. There are two primary mechanisms the brain uses for changing its own wiring on the basis of experience. One is the learning for reinforcement-providing and strengthening behaviors. There is also extinction for removing behaviors that no longer cause reinforcement. Sinclair was inspired by the Pavlov classic conditioning experiment where the Russian physiologist’s dogs learned to salivate at the sound of a bell when it was followed by food, and then had the behavior made ‘extinct’ when food reinforcement was stopped after the bell was rung. The process by which naltrexone works with TSM is called pharmacological extinction. Naltrexone must be taken every single time you consume alcohol, approximately one hour before the alcohol is to be consumed. By having naltrexone active in your body at the time alcohol is consumed, endorphins normally released by drinking are blocked. Over time, drinking loses its appeal. Because the use of naltrexone blocks the enjoyment one feels from drinking alcohol, drinking is gradually reduced over a period of a few months. Some people who have used the Sinclair Method are able to enjoy a drink or two socially without drinking to excess. Others choose to abstain altogether, but arrive at abstinence without acute cravings. Sinclair’s laboratory studies showed that the reinforcement from alcohol, in most cases, involved the opioid system. The system, which controls pain, reward and addictive behaviors, is also where morphine, heroin, and endorphin produce their effects. Medications such as naloxone, naltrexone and nalmefene block the effects of endorphin and other opiates. 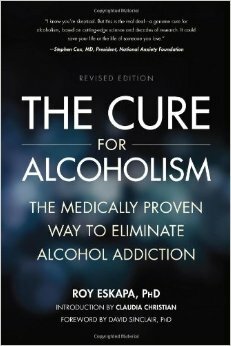 The Sinclair Method reasons that, if an individual drinks alcohol when one of these opioid antagonists is blocking endorphin reinforcement in the brain, the extinction mechanism would be activated, and produce a small but permanent reduction in alcohol drinking and craving. Over time, the desire to consume alcohol decreases and people either abstain most of the time or drink occasionally. Naltrexone is not addictive, and it does not directly reduce craving for alcohol. The Sinclair Method has been confirmed in more than 90 clinical trials around the world, and observed to be successful in approximately 80 percent of alcoholics. Naltrexone blocks the release of endorphins whenever alcohol is ingested. The blocked reinforcement caused by naltrexone whenever alcohol is consumed gradually weakens and ultimately extinguishes the behavior of drinking. The reduction in craving and drinking is progressive. Benefits can be seen as soon as 10 days after starting, but the effects are more than three times stronger after three to four months. The benefits continue increasing indefinitely as long as you take naltrexone every single time you drink alcohol. Naltrexone has no potential for addiction, does not make you feel high or low, and seldom produces side effects. The Sinclair Method is often effective without any intensive counseling, although education and medical monitoring are required. Naltrexone is a lifetime commitment. People with a positive family history respond particularly well to naltrexone treatment.